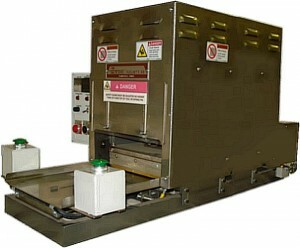 Table Top sealers clamshell sealers, clamsheel heat press - safer and more economical that RF sealing. Reduced tooling costs over RF or ultra sonic sealing. Uses heat and cooling cycle for for sealing thermoform clamshells and trays.. The standard machine features 1 load/unload station and two single acting sealing platens, one applying heat and pressure*, the second is a cooling station with pressure for smooth seals heat sync (from customer supplied cold water supply).There is a standard 8 x 12 inch and custom blister heat seal r platen sizes that you can choose from. The table top clamshell sealer has safety features build in such as low pressure safety descent with high pressure heat seal. Contact us for quotes.